A week can hardly go by lately without a new attack on environmental justice in Australia. The latest threat comes from Andrew Nikolic, Federal Member for the Tasmanian seat of Bass. The Liberal MP has moved to strip charity status from environmental groups, who he perceives as a threat to Tasmanian prosperity i.e. the Tasmanian logging industry. The motion was unanimously endorsed by his party at their Federal Council meeting. Some 13 groups would be impacted by the motion, no longer eligible to receive tax deductible donations. This includes prominent organisations like the Wilderness Society, the Australian Conservation Foundation and all state EDOs. Nikolic has described these environmental groups as engaging in political activism and illegal activities, and doesn’t believe that taxpayers should be subsidising their green agenda, which he believes is damaging the Tasmanian economy. This is the latest in a string of desperate attempts by Tasmanian Liberal politicians to rein in the power of conservation groups in the state. Last week, anti-protest laws were passed in Tasmania’s Lower House, aimed at stopping forestry activists through large fines and jail time. And you might remember Senator Richard Colbeck’s tried-and-failed-and-tried-again attempts to introduce legislation banning secondary boycotts, a powerful protest measure which so successfully brought the mighty Gunns pulp mill to its knees. It took UNESCO a mere 10 minutes to reject this ludicrous proposal, calling the bid ‘feeble’. In light of UNESCO’s recent decision, the conservative lobby is growing increasingly concerned. And it’s not just the Tasmanian Liberal Party who are worried. 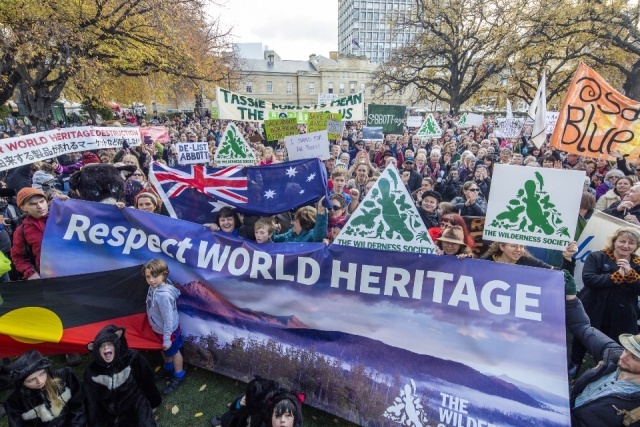 The growth of the grassroots environmental movement in Australia has ushered in a new era of environmental protest. Online campaigning has made large, crowd-funded legal actions possible, while social media has engaged and mobilised people to take part in blockades and protests. Recent victories against the destructive resources sector have resonated among Australians with the defeat of CSG at Bentley, a coal export facility at Keppel Bay and an open-cut mine in Leard State Forest. Two crowd funded legal actions against the government over their plans to industrialise the Great Barrier Reef has drawn international attention, and criticism. In moves some have called fascist, the government is trying to silence its critics by cutting their funding and attempting to discredit our scientific institutions. But gagging environmental groups serves only to galvanise the communities who live on the front line, who see first hand the destruction caused to their land, their water, their future. Communities across Australia are responding to the call to action, putting their time, money and bodies on the line – and winning.